I have a box of Recchiuti that I have been slowly savoring as I work on the Tarts project. The box is almost empty and, TA DAH, I have reached a major milestone in the work on the Tarts project! Your eyes do not deceive you. 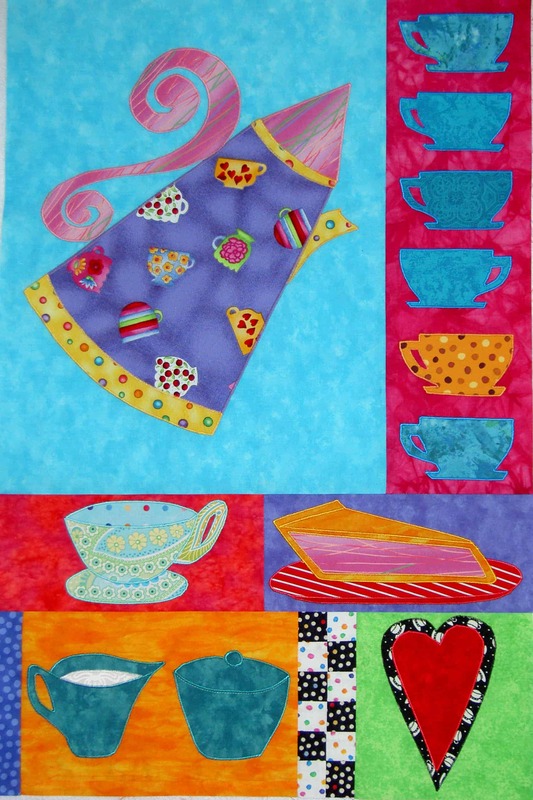 The Tarts Come to Tea top is completely sewn together. I had some bits of time over the weekend and used those bits to work on the Tarts. I really need to get this piece off my design wall and work on something easy. I resisted the urge, especially after all this time, to just throw the thing together. I really looked at it as my last opportunity to fix any despicable design decisions. My first order of business was to replace the yellow cup. 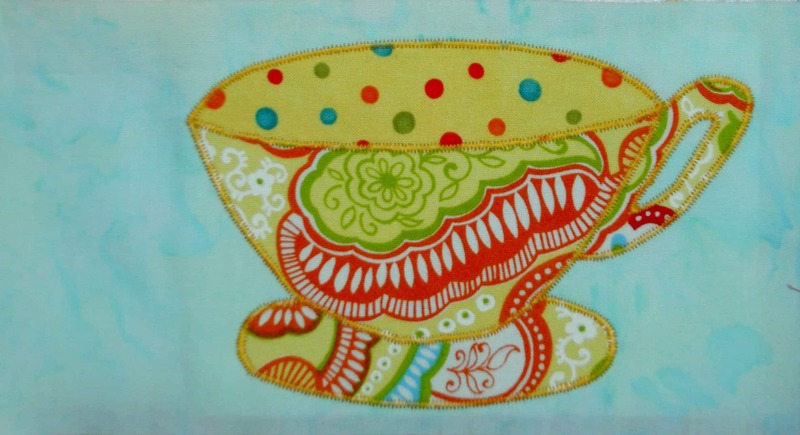 I like the cup itself and am pleased with the fussy cutting and satin stitch quality. As part of the complete Tarts Come to Tea design, it didn’t work. My eye kept jumping to it. 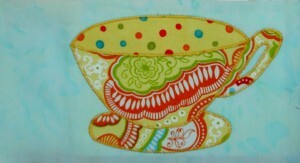 While I want the viewer’s eye to move around the piece, I didn’t want it to be glued to the yellow cup. TFQ suggested pie. Since I was thinking along the lines of a pastry or tart as well, I appliqued another piece of pie. I used the same design as the original piece of pie. The problem was that they were too similar. I didn’t make enough changes to the design, even though the colors/fabrics are different. The similarities are highlighted because the two elements are close together in the piece. I resolved the issue in my mind, however. I am going to applique’ some whipped cream on top of the new piece of pie, and perhaps a cherry. It will overlap on to the blue block above it. I planned to do it before the entire piece was sewn together, but I got caught up in the excitement and focus of the sewing and forgot. I’ll add it later this week or on the weekend. 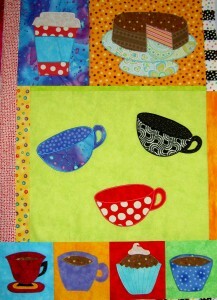 I had already started to sew sections together last weekend when I tried to tell myself I was finished. Still, there was a lot of piecing to do, so I got too it. 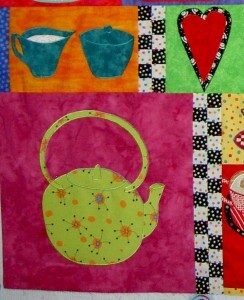 One thing I forgot about improvisational piecing is that one has to add bits and pieces in between. I really didn’t want to do much of that, because I liked the look of the blocks being next to each other. That meant some trimming and adding little bits, which I did, and which will, hopefully, be mostly hidden once the piece is completed. I couldn’t avoid adding some bits and I had to pay attention to the checkerboards, because I didn’t want to cut them off in the middle of a square. There were a few places where I couldn’t trim and augment. Those spots should be readily apparent from the photo. In general, I am pleased with the way the piece turned out. Quilting is next, of course. 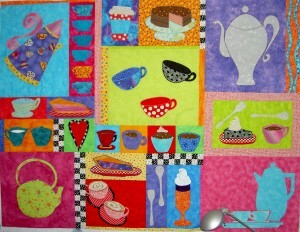 As I mentioned in the last post about the Tarts, I seriously thinking about quilting the piece myself. I want it to be done a certain way. I don’t think I am good enough yet on the longarm to quilt the detailed design I have in mind. I really want the cups and pastries to stand out. More thinking on this is required. I can’t really believe that it is together. It has been such a long process! It looks FABULOUS!!!!!! And I wouldn’t change not a single thing! 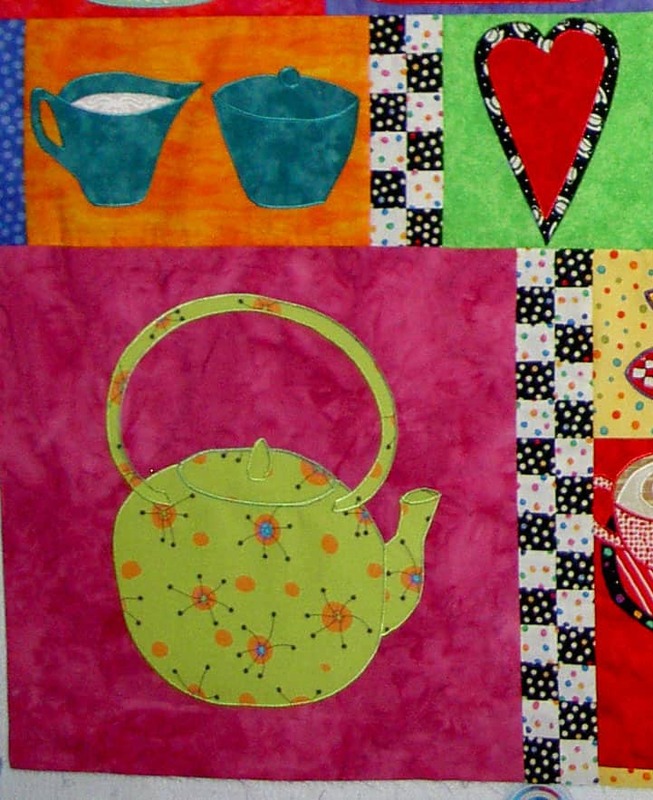 If you want your appliques to really stand out when you quilt, just quilt around their perimeters carefully. Then, when you quilt the background blocks carefully select threads that are a match to those background fabrics and quilt a little heavier. 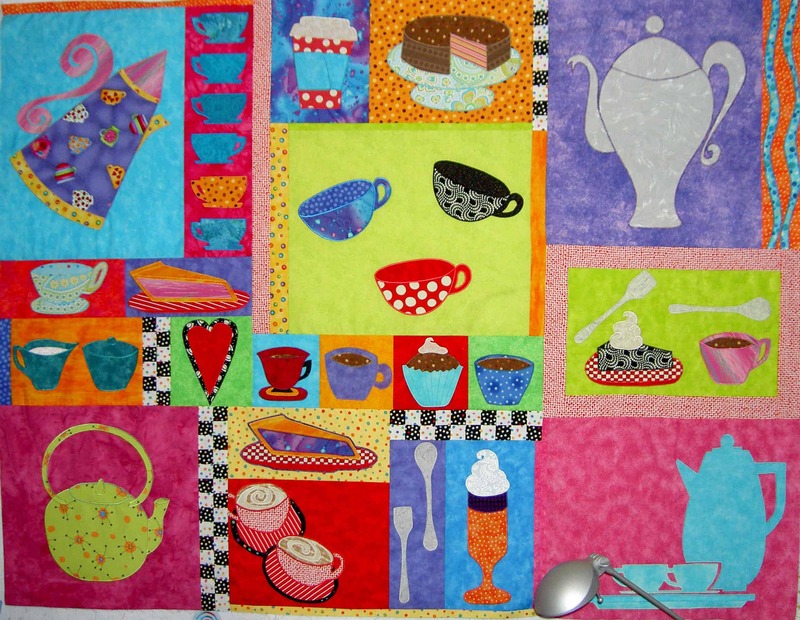 I am planning on quilting around the designs very carefully, not only to make them stand out, but also to keep the quilt together! Thanks, you guys! I feel like I have my own personal cheering section. Jaye – this turned out SO fabulous!!!! It is even better than I thought it would be (and that is saying a whole lot). GOOD FOR YOU!!!!!! Thanks so much for stopping by, Kristen! I am glad you like it. It was hard work!